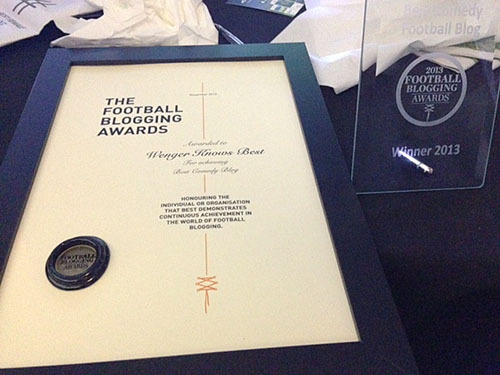 In the 2013-14 season, not only did we win little bit coveted ‘4th Place and FA Cup double’, but in fact a top top unprecedented treble – I won ‘Best Comedy Football Blog’ as well, at the ‘2013 Football Blogging Awards’! As a small small token of little bit banter, I celebrated this success by holding an open-top bus parade on this website. Look closely on the homepage and you might see the incident. Did I win again in 2014? Well, no. I was nominated for Best Social Football Account, which was outstanding. But, look errr, the ‘Best Comedy Football Blog’ category has not been held again since 2013, so, overall, I am still the champion.